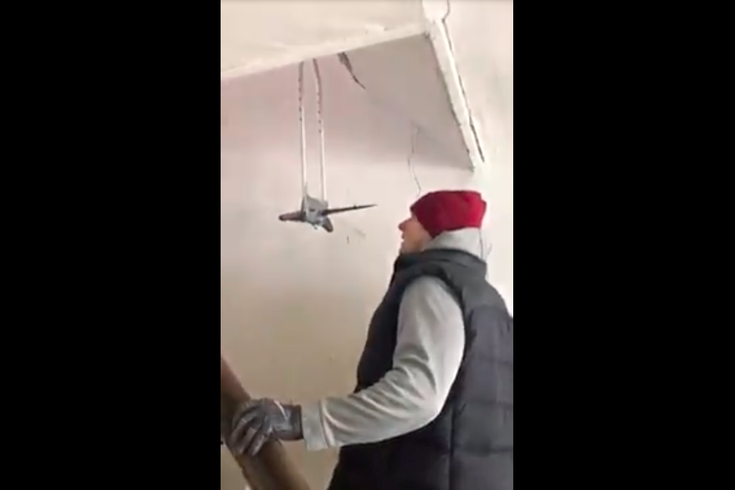 A screen grab from the booby-trapped row home seen in a viral video. Somewhat lost in the maelstrom that was last week’s “50 Shades of Maple Glen” real estate listing story was an equally eye-opening video emerging from a rowhome in Southwest Philadelphia. It started a week ago today when Ari Miller – “Property Manager, Entrepreneur, Philosopher & Spreader of Good Cheer” – of Real Estate Management Advisors LLC posted a jarring video to his Facebook page. Well that’s the understatement of the season. • A bunch of broken glass lining the bottom steps of a staircase heading to the second floor. • A trip wire that activates a trap reminiscent of those which Indiana Jones faced in the cave at the start of “Raiders of the Lost Ark." • Those in the house triggering the booby trap from a distance to safely gauge its potential effectiveness. “That would have f***** straight up killed you right in your f****** head,” says one of the workers after tripping the wire and seeing the knife come down, head level, along the steps. This is an accurate assessment. See for yourself. Uysaler told PhillyVoice on Wednesday that he couldn't give the specific address of the home, saying only that it was a distressed property in Southwest Philadelphia. The team was there to gauge what work had to be done before the house could be rehabbed. "Luckily, we stopped one of our guys before he walked into the wire," he said. "The whole thing was pretty crazy." He had to quickly run, so we couldn't get names and knife measurements, but suffice it to say, the trip wire has been cut and folks have been walking on eggshells in the property in the days since. UPDATE: Many eagle-eyed observers of local booby-trap videos noted that they'd seen this before Miller's post. They were right! An earlier version was posted January 15 by a Michael Vincent Jarzyk, per screenshots provided by one tipster. Uysaler said Friday he works with Jarzyk and gave him the video, which the former initially posted online on January 2, but was quickly taken down because "it was going viral." "That video was recorded by a member of our team and then published to warn wholesalers, investors, etc. in the possible dangers of this industry that most see as cut and dry," Jarzyk said.